In a world first, Canada’s Chris Hadfield unveiled a new money note — while in space. Hadfield spun a fiver before the camera Tuesday as part of a ceremony to announce new $5 and $10 bills that will be distributed in Canada this year. The $5 bill will feature two pieces of Canadian technology that helped build the station: Canadarm2, which is a mobile robotic arm, and the hand-like Dextre. The bill also shows an unidentified astronaut. That said, the choice to use Hadfield in the press conference was likely not a coincidence: Hadfield assisted with Canadarm2’s installation in 2001 when he became the first Canadian to walk in space. 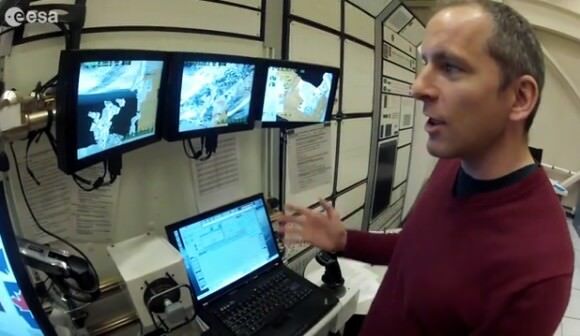 “These bills will remind Canadians, every time they buy a sandwich and a coffee and a donut, what we are capable of achieving,” said Hadfield, who is in command of Expedition 35 on the International Space Station. His comments were carried on a webcast from the Bank of Canada. The money note travelled with Hadfield in his Soyuz when he rocketed to the station in December, the Canadian Space Agency told Universe Today. The polymer notes are intended to be more secure than the last generation of bills issued in Canada. Polymer $20, $50 and $100 bills are already available, but the smaller currencies won’t hit consumer pocketbooks until November. “Featuring a sophisticated combination of transparency and holography, this is the most secure bank note series ever issued by the Bank of Canada. The polymer series is more economical, lasting at least two and half times longer than cotton-based paper bank notes, and will be recycled in Canada,” the Bank of Canada stated in a press release. As with the past $5 bill, the opposite face of the new bill shows a drawing of past prime minister Wilfrid Laurier. Also shown at the ceremony: the $10 bill, with a Via Canada train on one side and John A. Macdonald, the first Canadian prime minister, on the other. Both Jim Flaherty, Canada’s minister of finance, and Bank of Canada governor Mark Carney wore Expedition 35 pins at the press conference. “I hope that’s not London calling,” Flaherty quipped to laughing reporters when NASA’s Mission Control phoned in with Hadfield on the line. Hadfield is no stranger to space-themed currency. In 2006, the Royal Mint of Canada released two coins featuring him and Canadarm2. Hadfield and several other Canadian astronauts were also put on to Canadian stamps in 2003. You can check out the full set of polymer bills on this Flickr series uploaded by the Bank of Canada. On April 19, 2001, space shuttle Endeavour’s STS-100 mission launched to the space station, and in the payload bay was Canadarm2, a larger, more robust successor to the shuttle’s Canadarm. The Space Station Remote Manipulator System (SSRMS) is a sophisticated “construction crane,” and is responsible for much of the successful building of the ISS — module by module — in space. See a gallery of images of Canadarm2’s 10 years in the space construction business. Canadarm2 was installed on the ISS by astronaut Chris Hadfield during the first spacewalk by a Canadian. Canadarm2 has unloaded hundreds of tons of equipment and supplies ferried by the shuttle and assisted almost 100 spacewalks. Endeavour’s last flight later this month will mark Canadarm2’s 28th Shuttle mission. The Canadian Space Agency says that Canadarm2’s role on the ISS will expand as the orbital lab nears completion: in addition to performing routine maintenance, the robotic arm will make more frequent “cosmic catches,” where it will capture, dock and later release visiting spacecraft, as it has done with the HTV. When the space shuttle retires, reusable commercial spacecraft, like SpaceX’s Dragon and Orbital’s Cygnus, will be used to bring supplies and equipment to the ISS. Canadarm2 will capture each of these visiting vehicles. In late 2011 and early 2012, Canadarm2 will capture a series of 6 commercial spacecraft in just 7 months, beginning with the Dragon spacecraft, currently scheduled to arrive in October 2011. See more images and info at CSA’s website.